"Due Date" is a comedy written by Alan R. Cohen and Alan Freedland and then later revised by Adam Sztykiel. The film follows, an expectant dad and his unlikely travel companion (Galifianakis) as they race cross-country in hopes of making it home for the birth of his first child. "Due Date" is being directed by Todd Phillips and is planning for a October shooting start in order to be released early in June 2010. 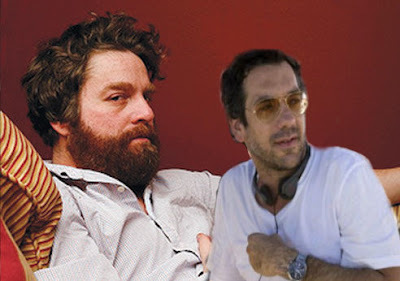 Todd Phillips has hired Scot Armstrong to co-write the sequel to The Hangover with hopes to have it in theaters by Memorial Day 2011. The Hangover is Warner Brother's highest grossing R-rated comedy and it seemed like a no brainer that the studio would move froward in developing a sequel. No word on if Bradley Cooper, Ed Helms or Justin Bartha would return, but it would be a huge surprise if they didn't. I can't say I am excited about either of these projects in the slighest. "Due Date" sounds terrible and a sequel to The Hangover just doesn't sit right with me. The Hangover was a perfect single film, similar to Wedding Crashers, it doesn't need a sequel. Furthermore, a sequel may just end up ruining all the originality the first one had. In related news, one of the other films Galifianakis was being courted for "Man-Witch" Variety reports Phillips has stepped down from director duties leaving the project empty for a director and lead.